Alcatrazz, David Lee Roth, Whitesnake, as well as having recorded with artists such as Mary J. Blige, Spinal Tap, and Ozzy Osbourne. Additionally, Vai has toured with live-only acts G3, Zappa Plays Zappa, the Experience Hendrix tour, as well as headlining international tours. 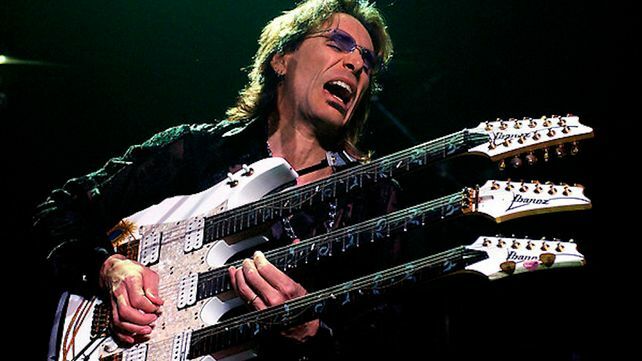 Steve Vai, a descendant of Italian immigrants, was born in Carle Place, New York on June 6, 1960. He is the fourth son of John and Theresa Vai. He described his first experiences with music as, "at the age of five I walked up to piano, hit a note, and noticed that to the right the notes go higher and to the left the notes go lower. In that very moment, I had a full-on epiphany. I was flooded with the instinctual realization of how music was created and how it worked from a theoretical standpoint—the whole language of music was very obvious. I also understood immediately, instinctually, and unequivocally something that has only deepened through the years that the creation of music is an infinite personal expression. I realized that I could do this, I could make music, and it could be whatever I want." In 1973, Vai began to take guitar lessons from fellow New York native Joe Satriani, and played in local bands (The Ohio Express, Circus, and Rayge) throughout his high school years.Vai cites artists such as Jimmy Page, Brian May, Ritchie Blackmore, Jeff Beck, Jimi Hendrix, as well as jazz fusion guitarists Allan Holdsworth and Al Di Meola as some of his major influences in that time period. In 1978, to further pursue his interest in music composition and theory, Vai attended Berklee College of Music in Boston, Massachusetts. While at Berklee, Vai began working for Frank Zappa as a transcriptionist, and in the middle of his fourth semester, moved to California to start his career as a session and touring artist for Zappa.Also while at Berklee, Vai met his future spouse Pia Maiocco, with whom he has been together since; they have two children.In 2000, Vai was awarded an Honorary Doctorate of Music from Berklee. Vai has been described as a "highly individualistic player" and part of a generation of "heavy rock and metal virtuosi who came to the fore in the 1980s".The launch of the Ibanez JEM guitar developed and co-designed by Vai was described as the "exact moment the entire guitar landscape was reshaped".He also designed the first commercially produced seven-string guitar, the Ibanez Universe, which became popular among bands in various genres the 1990s, including nu metal,death metal, and progressive metal. He released his first solo album Flex-Able in 1984, while his most successful release, Passion and Warfare (1990), was described as "the richest and best hard rock guitar-virtuoso album of the '80s".